At UNIST, all levels of students can join research internship programs. UNIST offers informative research internship programs for students from all levels of education, so they could experience using research equipment at laboratories and develop their academic interests. Therefore, UNIST campus is always full of future brightening scientists even during the summer break. Ms. Shim Jung woo, Junior of Energy and Chemical Engineering School, is one of those busy undergraduates during summer. She wakes up early in the morning and spends a busy day at Laboratory, Gymnasium, and Study Room on UNIST campus. Let’s follow Ms. Shim’s busy day. Fitness is an important part of Ms. Shim’s daily routine. Ms. Shim always tries to fit exercise into her busy schedule since she gets more energetic after working out in the early morning. Therefore, Ms. Shim drags her sleepy body and stops at UNIST Sports Center before going to the Laboratory for research. Usually, she does light aerobic exercise, but sometimes does anaerobic weight training to build more strength. Sports Center is in a perfect location with an easy and quick access from the laboratory and dormitory, so it is not difficult for her to fit exercise into her daily routine. Until last year, Ms. Shim was a member of Unistation, on-campus broadcasting station of UNIST. She used to do online radio broadcasting and a noon news everyday. However, she is completing research internship at Prof. Cheol-Min Park’s Chemistry laboratory of Natural Science this summer. “I like studying about Organic Synthesis because it can be applied in various areas with a simple theory.”, says Ms. Shim. Since Ms. Shim is interested in Organic Synthesis area, she is planning to research on Medicine in order to help as many patients as possible. Every class is taught in English at UNIST, so Ms. Shim has to dedicate more time and effort to review the classes she is taking. One of the advantages about group studying is that students can gain a deeper understanding of the topic they are covering in classes by discussing with classmates. The disadvantage is that students could end up wasting time on small talks, but group study is surely useful for students who do not speak English as their first language. 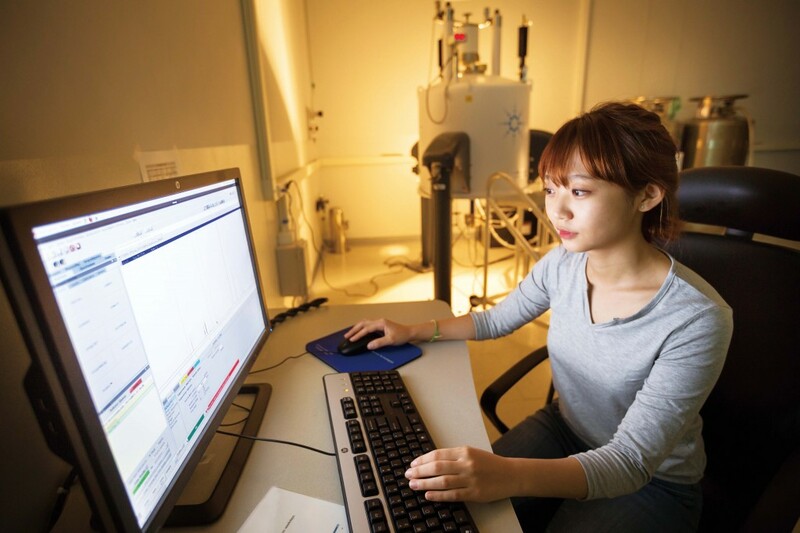 Ms. shim sets samples at the laboratory in the morning and takes pictures of samples by using NMR on that night. NMR is an analytical chemistry technique used in quality control and research for determining the content and purity for a sample as well as its molecular structure. At UNIST, all levels of students can use the newest research equipment by making simple reservations at the laboratory.